These Frames are made of American Hardwood by American Workers. They are extremely intricate in detail and high in quality. These frames are worthy of your precious photographic memories. Intricately carved American Hardwood is showcased in this quality 5X7 picture frame. 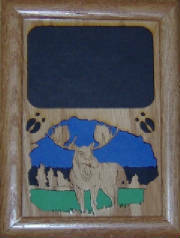 Blue Sky, Dark, Distant Mountains and Green Fields accent this majestic wooden Moose complete with trees and signature hoof prints. Photo Area Approximately 4 X 3 inches. Place a treasured memorie beside this Magnificent Moose today. 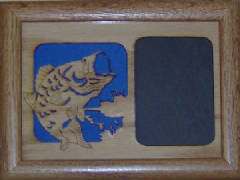 A Magnificent Jumping Bass intricately carved in wood within a Blue Water Background. A perfect frame for fishing photos or special memories. 8X6 outside diameter with an approximately 3X4 area for your personal photo. 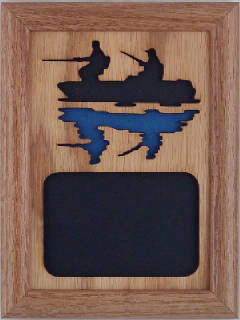 Arrives ready to stand or hang on the wall for the perfect presentation of Bass Fishing Photos. Hand crafted from solid American hardwood. Black Silloetted Boat and Anglers Mirrored by a Blue Water Reflection. A quality frame for your fishing memories. Green Grass, Dark, Distant Mountains and Clear Blue Sky. Intricate Carved Wooden Detail makes this frame a true piece of art. These are hand crafted frames constructed of solid hardwood. 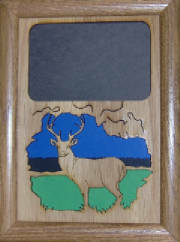 A high quality frame for your outdoor photo. 4X3 area for your memorable photo.